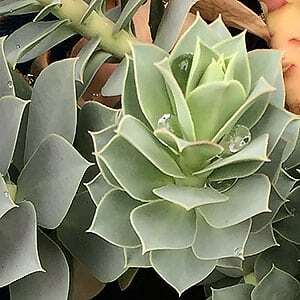 An interesting low growing succulent, Euphorbia myrsinites forms long trailing stems with spirals of grey / blue leaves. This is a useful plant for growing in rock gardens or containers where the foliage is an attraction year round. This is an easy plant in a humus rich soil and full sun to afternoon shade. It does require some protection from very hot sun in dry areas over summer. Plant in a free draining soil. Use a general purpose fertiliser once a year in spring. Prune as needed to maintain a bushy growth habit. Propagation is easy from cuttings as well as from seed. 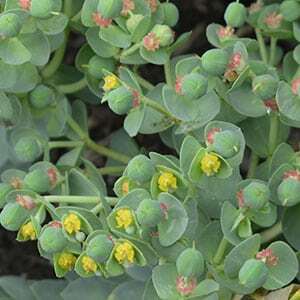 As with other Euphorbias, care must be taken when handling this plant. The sap contains a latex and this can cause serious rash problems and skin irritation. When handled carefully it does make a very attractive plant for containers. Always wear gloves, eye protection and skin protection when handling. This is also a plant that can self seed readily in the right conditions, so consider planting position. In some areas it is regarded as an invasive noxious weed. Common Names – Donkey Tail Spurge, Creeping Spurge or Blue Spurge. Soil – Humus rich with some moisture through summer in dry areas. Foliage – Grey/Blue growing in spiral patterns along trailing stems. Flowers – A green to Yellow fading as they age.